ETA: THIS CONTEST ENDED AS OF 12/7/18. But keep checking my blog for new posts because more contests will be announced soon 🙂. As promised, I’m now starting the first of my Holiday Favs Giveaways! Yes, I know I called it the 12 Days of Christmas Giveaways last week, but then I caught the flu, so everything’s now been shortened to match my new state of sickness. Hey, at first I was going to rename it Frosts 12-Way Favs, and then I read that title out loud. Whoops ;). Anyway, these giveaways are brought to you by SHADES OF WICKED, my latest release. So, before we get to them, let’s thank our sponsors, Ian and Veritas, shall we? Who are they? new visitors might be wondering? Let me introduce you! Veritas’ normal role is police, judge and jury to reprobates like Ian. But she has her own ax to grind with Dagon, so if she can use Ian as bait…well, all’s fair in law and war. As they scour supernatural hotspots to perfect their trap, Veritas soon realizes Ian’s devil-may-care, roguish image hides something much more powerful. And Ian discovers that Veritas has shocking secrets of her own. As they’re drawn to each other with a passion as intense as their peril, either love or justice will prevail. But each will have devastating consequences… Order: Amazon, B&N, IndieBound, Apple Books, BooksAMillion, Kobo or Malaprops. Okay, shameless promo plug out of the way, let’s get right to PRIZE 1 of the Holiday Favs giveaways! First up are books, books, books! THREE WINNERS will get to choose from ONE of the books below, which contains ALL the novels in my Night Huntress, Night Huntress World, Night Prince and new Night Rebel series, with an added extended novella from The Bite Before Christmas anthology because it’s an important Cat and Bones story that I really should have just made into a complete book, but didn’t. I even arranged the books in my Author Recommended Reading Order because not even the flu can limit my ocd, ha! Anyway, here are the pretties. The three winners can choose to have them in either paperback or ebook. This part of the contest is open to US and international readers, although due to ebook restrictions, any international winners are limited to receiving their prize in paperback only. But I don’t only want books! some of you might be saying. I hear you! How about some chocolate, too? 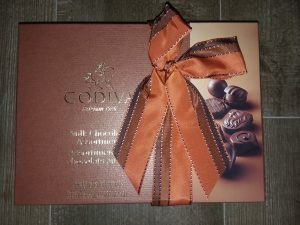 ONE LUCKY WINNER will also get a box of Godiva chocolate PLUS any book from my collection featured above, in either paperback or ebook, winner’s choice. This part of the contest is limited to US readers only. But wait, there’s more! What goes better with books than chocolate, you wonder? Books, chocolate, AND MONEY! 🙂 ONE LUCKY WINNER will get any book from my collection above, PLUS a box of Godiva chocolate, PLUS a $25 Amazon egift card! This part of the contest is open to US readers only. If you want your chance to be one of the five total winners, then tell me your favorite holiday-themed movie. For example, mine would be a tie between It’s A Wonderful Life and National Lampoon’s Christmas Vacation. I like the uplifting, timeless truths of It’s A Wonderful Life, but let’s face it, my actual holidays more closely resemble the mayhem of Christmas Vacation ;). This category is open to all holidays, of course. Or, if you don’t have an official holiday-themed favorite movie, holiday-adjacent is fine, too. If I were picking for that category, mine would be The Family Man, where the holidays are barely mentioned because it’s mostly a fish-out-of-water story combined with a meant-to-be love story, all wrapped up with a tinge of supernatural intervention. Hey, you can rock the holiday horror category, too. Gremlins was an all-time favorite of mine, and Santa’s Slay still makes me laugh out loud. Contest opens NOW and ends Friday, December 7th at 9am Eastern time. Please only enter once per person. Thanks and good luck! A Christmas Story and Elf.